If there is one chart out there that everyone is talking about (or should be), it's the one pictured below depicting the relative performance of high yield and crude oil. Although the long-term relationship between the two has been very scanty indeed over the years, since the beginning of last year the relationship has been fairly tight and, presumably, causal, given the preponderance of energy firms in the high yield index. However, as you can plainly see there has been a significant wedge driven between the two series as crude has been hit hard over the last month or two while high yield has rallied quite smartly. 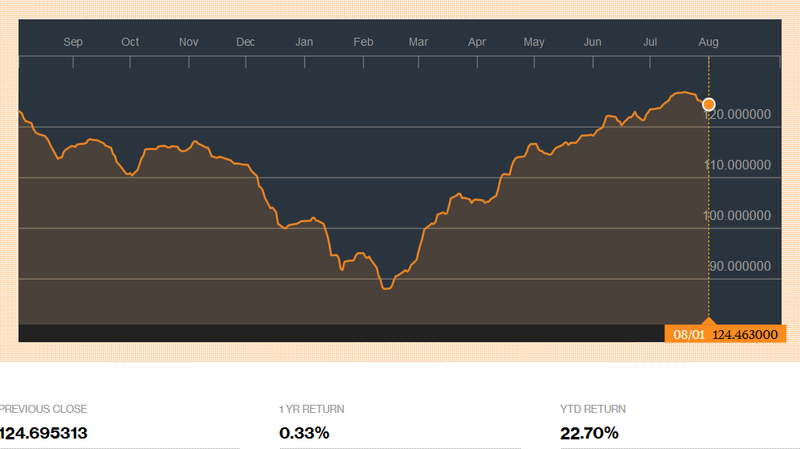 The reason for this is very simple indeed: energy credit has remained exceptionally resilient, with the Bloomberg energy high yield index near its highs and up more than 22% YTD. Now, Macro Man will leave it to the credit experts out there to go through each name in the index bond by bond and determined whether they have managed to refi/roll their exposures and slap on massive crude hedges at the ding dong highs. Macro Man supposes that it's theoretically possible, but it seems rather unlikely. What he does know, however, is that the calls from the cognoscenti that the crude market would be back in balance by the current quarter or at latest next quarter are looking rather wide of the mark. Now much like in credit, your author does not pretend to any particular expertise. What he can offer, however, is big picture observations from a reasonably intelligent outsider that sometimes get waved away by specialists, who tend to focus on minutiae. And the simple fact is that crude inventories in the United States (where the best and only really reliable high frequency inventory data is published) have seen their earlier decline in the growth rate ebb and indeed reverse. While it's true that the inventory growth rate is well below levels that pushed crude to its lows, it is also the case that the current build rate remains very high by historical standards; the y/y change in commercial crude inventories is in its 90th percentile of the last two decades. 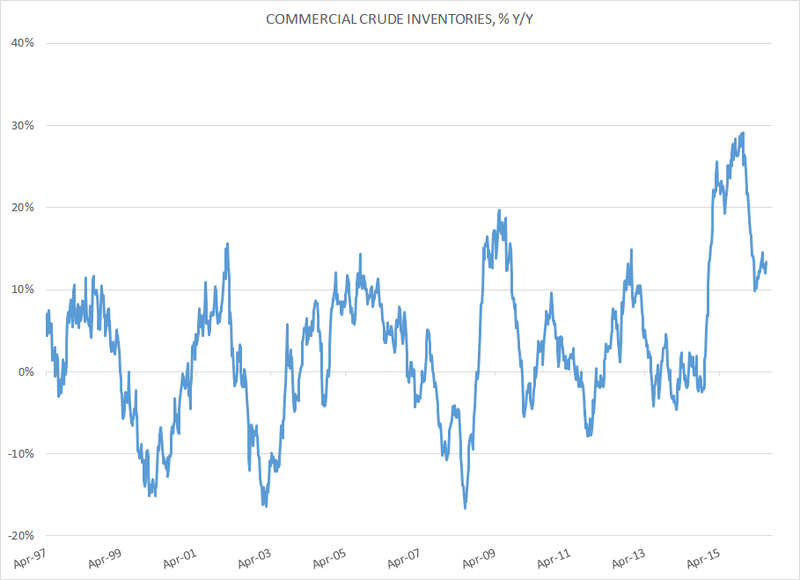 It would be one thing if that growth rate were coming off a low level on inventory, but in point of fact US commercial crude inventories are essentially at record highs. Perhaps the US is an anomaly, but given tepid levels of growth elsewhere that seems rather unlikely...almost as unlikely as supply and demand being in balance when the market keeps throwing out excess barrels that add to inventories on a weekly basis. As such, a small klaxon is ringing in Macro Man's office calling out "Achtung! Achtung!" (OK, not really, but it's a lovely image, isn't it?) 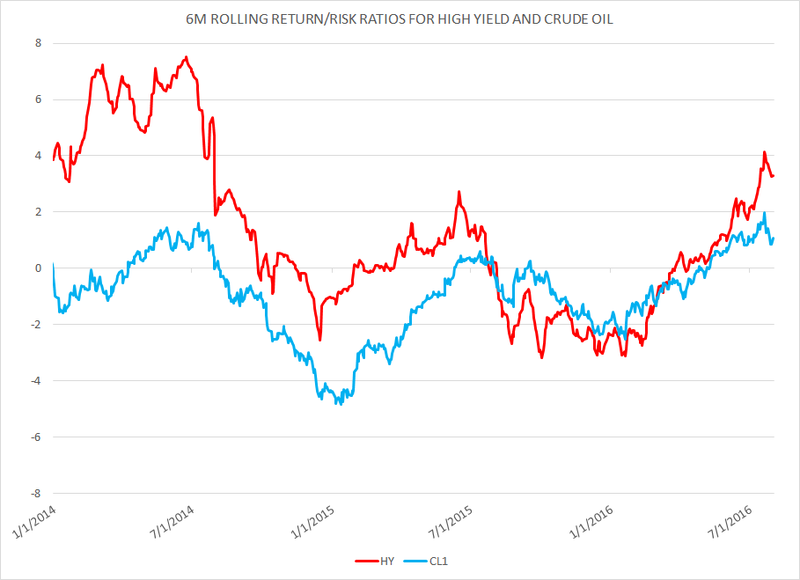 It's true that despite the apparent overlay correlation above, the investment performance of crude and high yield has not exactly been joined at the hip, as a comparison of six month rolling information (i.e., return-to-risk) ratios illustrates. Note that the crude ratio below does not account for monthly rolls, so is obviously overstated. This is one of the few charts I really keep up with, and if you want to be long US Equity at this juncture, because of course you know you can sell and rebalance that portfolio with absolute hindsight in play, then please be my guest. Kuroda to walk? reached limits. Can sight govt meddling. No independence. Well really HYG vs SPX is what I prefer to look at. For me, oil v high yield is effectively the same chart as simply by composition hi yield will likely follow oil down. The real significance is when the broader indexes turn lower as hi yield turns. @checkmate - All this stuff about margin debt etc is all v well, but "this time really is different". There is currently more QE underway by CBs than there was when the Fed was engaged in saving the world post-GFC. They will NEVER stop printing money, and equities are literally on that "permanently high plateau". The Dow Jones will reach 40k before it reaches 10k. @MM - I'm with Dr Bob on this - the real correlation breakdown has been between oil and broader equities, which has allowed high yield to look resilient, temporarily or not - also, this time around, there just seems to be a much greater belief that this selloff in crude is temporary as we inch closer to that rebalance in the 2nd half of the year which crude bulls have been pinning their $70 hopes on. Wobs and jiggles aside (which for crude tend to be 40% and not 5% like some other assets) the evidence is growing that the crude glut spilt over into products as a result of chinese teapot refinery activity in H1 - we will see. The optimism about crude and energy equities these days seems to only be rivaled by that for Facebook and amazon. "this time really is different". No , actually it never is where it counts which is all about behavioural ,but please go ahead and think whatever rational works for you. If we get another dump to $27 or so on inventory or whatever narrative it will be a really painful double whammer for most of the supply side again. Remember Venny for example was just going under the last time, and this time it already is under. And today many offshore drillers are close to being bust, which wasn't necessarily the case in Jan-Feb. AFAIK oil demand hasn't gone lower and supplying it hasn't gotten any cheaper. Inventory isn't really important imo as any surpluses will get quickly chewed up once demand and supply swing around which will eventually happen in a very sudden fashion. Just a waiting game at that level. If we get to those levels again, the next bounce should be even bigger than this one. PLN worth a look today. FX loan proposal looks benign enough. There's a sizable risk premium in the currency to price out. Regressed on rate differentials, PLNHUF should be 75 versus 72 last. Now trading at top of range of the past three months, right on the 200 DMA. Any pushback welcome. See Hussman for some truly filthy charts if you're interested. There you can see the full panoply of time series manipulation, axes compression, 1st vs 2nd derivatives etc. With enough work the data to support any hypothesis can be mined. does anyone have any sensible guess for todays performance pattern in Europe? banks -4% and lets by unilever??!? Art Berman, a petroleum geologist, says "More than anything, rig count reflects capital flow. Many believe that oil prices drive the rig count but it is really capital flow that drives rig count and production and that affects oil prices. When oil prices fall and oil-price volatility increases, the floodgates of capital open. Every genius-investor wants to buy low and sell high. " @celeriac Yes, i tried to allude to the dirtiness of the chart by pointing out the lack of historical correlation, though the different axis scales on a short run horizon don't bother me so much as that can just be a function of different volatilities. To be sure, though, you often wonder what the performance of the Hussmans of the world would be like if they worked as hard to find out where they're wrong as they do to demonstrate that they are right. Oil is waiting for Api's to put in a fake bounce into DOE's and get ripped again. Go and read what Commerzbank said about their situation. Banks are all smoked since the EBA results. Buy the rumour, sell the truth. If sovereign yields go up, all other yielding assets mus treprice to reflect. @MM - To be sure, though, you often wonder what the performance of the Hussmans of the world would be like if they worked as hard to find out where they're wrong as they do to demonstrate that they are right. true dat - I think his (Hussman's) model is completely powerless in capturing liquidity as a factor, even if it seems to do a good job of capturing long term fits in corporate earnings and valuation - he keeps glossing this disconnect away as a CB distortion which has been running for 5 years, but that doesn't change the fact that it matters - 12 YO and sigma would probably not even agree that an excess of liquidity is anything but permanent. If anything happens to get yields back over 2.5-3.0% I think there could be quite the comeuppance for risky assets - I see very little sign of that happening, but will observe that the US 10Y is a paper asset like any other, and so are JGBs and bunds - if their yields back up simply because momentum turns, could get interesting in a hurry. @henner - your phrase "no other chance of not hiking" may in fact be one of those accidental gems - so so true. Your point on how the chart was presented is accepted MM. Maybe it's not cool to read civil servants write about markets, but I think they did okay. @wcw there were plenty of other oil market people, including a few referred to in the comments on this site, who were calling for the market to be in balance by roughly now a couple of quarters ago. Clearly someone was talking about it. I just don't know who it was supposed to have been. Yen stronger, looks set for a run at the 100 barrier once again. CADUSD still looks vulnerable to another leg down (see oil). EURUSD above 1,1200 (full marks to Henner and the other people who called that one). Oil is making new lows every day. Risk assets weaker. EEM may be rolling over here. Everyone needs to keep an eye on JGBs after the behavior of that market last night. If JGB yields continue to move higher and take global yields along for the ride, then we are going to see a full blown volatility spike in the next few days. Even the most venerable and cruel of widow makers finally dies of old age (not saying this is it) and when it does there is going to be carnage. SEK also looking interesting today. EURSEK has looked expensive relative to rate differentials. Various theories for this ... Swedish banks' USD funding pressured by outflows from CP market ahead of the October rule change, thin Swedish (July) holiday liquidity, etc.. Probably most convincing one is just the steepness of SEK curve attracting carry-seeking flows, but the curve has flattened a lot the past couple months so maybe we see less of these flows going forward. Feedback welcome. In case you missed it: Italian Banks index plunged 6% w/ Monte dei Paschi down 16.1%, UniCredit down 7.2%. Sometimes it's not the amazing incredible unexpected Black Swan that takes the market down. It's just a bunch of mucky ducks that have been splashing in the mud for ages without anyone panicking over it. Italian bank solvency crisis and JGB mini-meltdown at the same time, anyone? There might be some 12 y-o here who have never seen (or at least never had to trade) a really big systemic risk off event. We all receive an education from Mr Market eventually. MM, thanks for another good post. May I offer one explanation as to high yield. Most US E & P companies are more exposed to Natural gas and natural gas liquids ( "NGL"). Both recovered as did crude, but neither fell back into the bear market as did crude. So many US E & P, despite the drop in crude are in much better shape because of the fact natural gas healed steady and NGL rallied a bit. If you did a graph of nat gas, crude, NGL and high yield it might make more sense (but I suspect, you would still need a chart of the S & P to really make things make sense). Sorry, I may be blind, but not sure i see much in you chart of crude inventories. We are in seasonally weak period. Price is and will be under pressure till October. But US supply has fallen by over 1.2 million b/d, and non OPEC supply has fallen behalf than amount. Sometime soon, maybe next year, long lead time projects like offshore will start to decline (offshore production increased in 2005). So to me there is no doubt by 2018 you get shortfall in oil production. By then demand will exceed supply and supply will be dropping while supply will be increasing. The question is when does market figure that out. Crude supply is like an ocean liner, it continues in direction it is going (whether up or down) for a long time after the price of oil you indicate supply should go the other way. MM after all these years I you finally made it on Bloomberg. Congratulations ;-) For better or worse I think your fan-base will increase substantially after this. 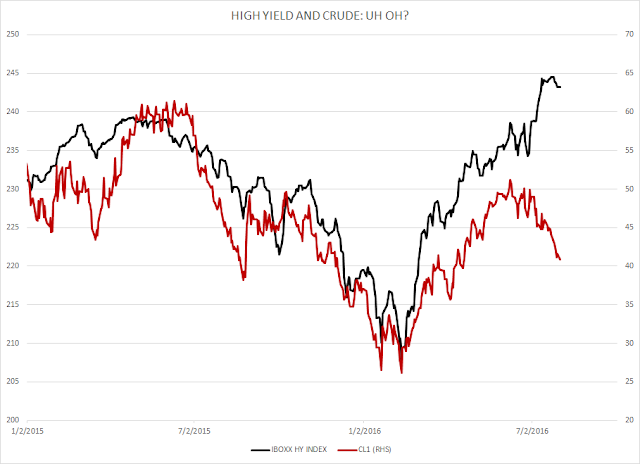 The financial blogosphere is on high alert over the apparent disconnect between tumbling oil prices and high-yield bonds barely off their recent peak. SRX, I also saw the talking heads on BBTV, this morning, with MM's chart. It was also picked up by the Daily Shot, about 3/4 of the way down the chart deck. I thought the interweb was so much bigger? Great post! Can you please elaborate on your point #8 ?